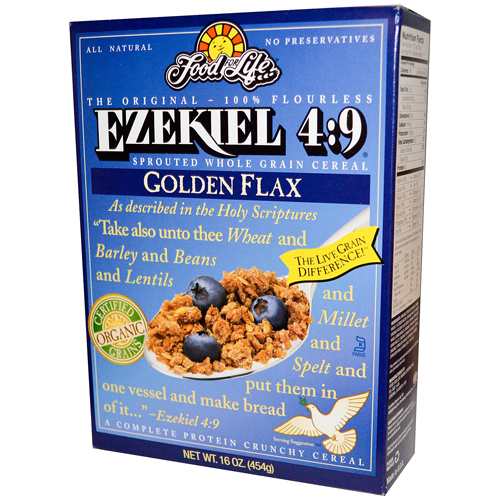 Food For Life Ezekiel 4:9 sprouted grain cereal - golden flax flavour - is made from freshly sprouted certified organically grown whole live grains, legumes, and seeds, and contain absolutely no flour. Food for Life believe in sprouting the grains they use in their cereals because sprouting is the only way to release all of the vital nutrients stored in whole grains. To unlock this dormant food energy and maximise nutrition and flavour, they add just the right amount of water to healthy, whole, organically grown grains which are already bursting with nutrients. Beneficial enzymes are activated which cause the grains to sprout and become a living food. Food for Life's exclusive sprouting process not only increases valuable nutrients but also causes a natural change that promotes more efficient assimilation of the protein and carbohydrates through enzymatic action. Exclusive slow baking techniques help preserve these valuable nutrients and retain the important natural fibre and bran. This unique cereal contain no refined sugar, no preservatives, no artificial colours or flavours, no shortening and no cholesterol. 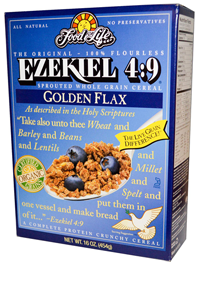 So if you're looking for nutrition in a cereal, reach for the sprouted grain cereals from Food For Life and partake of the miracle. Your body and taste buds will know the difference.